Your studio’s curriculum or syllabus determines what your students are required to learn to progress in your martial arts style or system. It tells the teacher what the content of a training session or class should be, but it doesn’t tell you how to structure your classes so that you capture your students’ interest and attention. Engaging students is crucial for any teacher who desires to get important lessons across and internalized. Engagement is the vital part of a successful training session. Your ability to involve and focus a student’s attention is the difference between a memorable lesson and just another boring workout. Get physical --- Be the example for the class and create a spirit of teamwork. By your example, make first-rate martial arts movement a group objective that everyone pursues together. Combine words with demonstrations. The martial arts are about movement, not verbiage. Give examples of what you’d like to see and experience in the student’s performance. Consider giving examples of problem areas, mistakes, etc. Occasionally, the best example is simply demonstrating --- what it’s not! Be enthusiastic. Use your voice and body language to show you are glad you have the opportunity to train an important martial arts topic. Use words like "we" and "our" to maintain engagement and increase motivation instead of standing there saying, "you need to, "you should" or "don’t do”. Keep yourself and the class moving whenever possible. If you seem as if you'd rather be somewhere else; indifferent, bored, or distracted, your students will be, as well. Speak firmly and with conviction. When you do stop moving, let your tone say that you believe what you're saying is important. Remember, you're trying to “sell” students on the importance of the material you are sharing with them. Make eye contact. Don't just read your notes. It’s important to look up and around the group as you talk. Interact with and make eye contact with each learner several times during the session. Use everyday language that is age appropriate. When your class includes technical terms, explain and demonstrate what they mean. Consider writing them on a board, mirror, flip chart, or drawing a diagram. This method will engage both your visual and auditory learners allowing students to see the words, direction, ideas, etc. as well as hear them. Take skill levels, education, and language proficiency into account. An effective teacher uses both language and vocabulary that the specific group of students can readily understand. 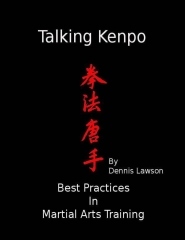 For example, I remember a class that senior instructors Mark Brosten and Martin McLoughlin taught during the Kenpo World Championships in Jersey, Channel Islands. This children’s class was comprised of students who spoke predominantly French, Spanish, and Dutch, as well as, English. These instructors adapted to the challenge by limiting their talk; focusing on the universal “language of motion” of the martial arts, keeping the class active, fun, and always moving. Similarly, if the student's skill and vocabulary are limited, the training must account for that limitation. You can teach the same martial arts principle to a group of five year olds or a group of adult black belts, but you must tailor the presentation of the idea to your audience. When you choose to speak, vary your intonation, but keep your tone warm and friendly. Don't lecture. Talk normally. Maintain a comfortable speaking pace. Don't speed through or drag out your words or demonstrations. When you vary the volume of your voice and the intensity of your movement, that variety helps maintain student interest. Stay focused. Stay on topic and on-track. Keep an eye on your allotted time and pace of the class accordingly. This will ensure that you have time to cover your content. At the end of class, reinforce the theme of the lesson to prevent confusion about the real point of the training session. Content is great, but if it's not transferred, internalized through repetition, and retained, it is of no use to your students. Contrary to the old cliche, those who can, teach. Teaching is a skill unto itself; so as a martial artist, make sure you develop your skills as a teacher, trainer, and coach. Teaching skills, not unlike a good roundhouse kick, take many hours to perfect. To be an effective teacher, you will need to spend time preparing your delivery of the class (training) to enhance the student’s internalization of your lesson. Don’t hesitate to put the necessary time in to become a better teacher. After all, how long did it take for you to learn the physical movements of your martial art?